Die Veneris, videlicet, 3 die Junii. Report from the Committee for borrowing Money of the City. Thanks to be given to the City. Addition to the Order for receiving the Magazines from Hull. Message to the H. C. for their Concurrence to it. Letters from the King to the Lord Admiral and Earl of Pembrook, to attend Him, dated at York. They are ordered to attend the House. Committee to draw up a Declaration about the King's sending for Lords. John Van Hesdonche's Petition, for quieting his Possessions in Norfolk. Message to the H. C. for Thanks to be given the City, for their chearful Compliance in lending Money. Report from the Committee for Indemnity to the Militia. Delinquents sent for, in Tamer's Cause. Message from the H. C. for a Conference, about Hull Magazine. To sit P. M. and for a Conference about Letters from Lincolnshire. King's Letter to the Earl of Northumberland, Lord Admiral, to attend Him at York. King's Letter of Licence to him, to be absent from Parliament. Sir Thomas Cary and the Bishop of Ardagh. King's Letter to the County of Lincoln. Message from the H. C. about the Treaty with the Scots Commissioners for Ireland; and with an Order about the Money arising from the Sale of the Crown Jewels. The King's Letter an Opposition to the Ordinance of both Houses. and with an Ordinance for sitting out Ships for the Adventure for Ireland. Report of the Conference about the Order for receiving the Magazine from Hull. Ld. Willoughby, Lieutenant of Lincoln, opposed there by the Earl of Lindsey, who has a Commission from the King. Earl of Lindsey sent for, as a Delinquent. Speaker's Letter to Lord Willoughby. The House appointed the Lord Wharton to sit Speaker. The Lord Admiral reported, "That the Committees were Yesterday at London, about borrowing of Money for the present Occasions of Ireland, and a Common Hall met there; and the City expressed a great Forwardness and Chearfulness to further the Supply of the Monies, as was desired; and have promised to raise speedily One Hundred Thousand Pounds, by the Companies." Hereupon it was moved, That the City might have public Thanks given them, from both Houses; and to express how careful the City is for the Safety of the Kingdom: And it was Resolved, To have a Conference with the House of Commons, to desire that the same Committee may meet this Afternoon, to draw the Thanks which is fit to be sent them, and a Declaration of their Readiness; and that the same shall be printed. 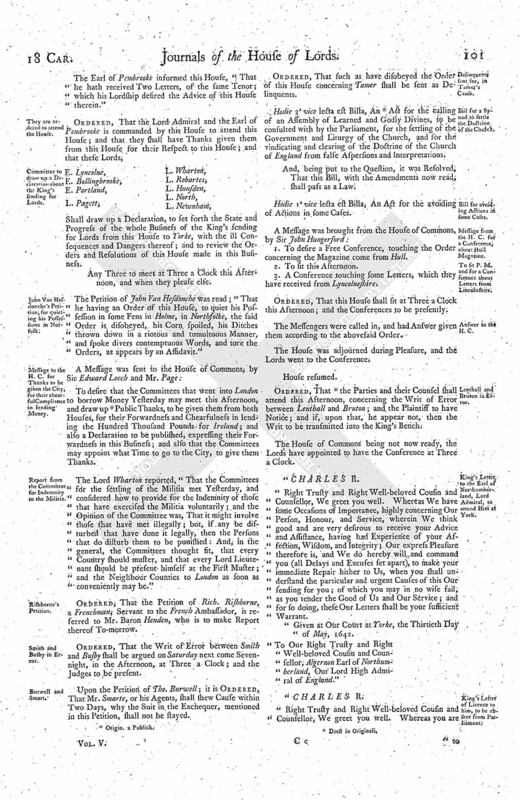 The Lords added these Words unto the Order brought up from the House of Commons, concerning keeping the Magazine that came from Hull ["as shall be issued out by the King's Authority, signified by Order of both Houses of Parliament"], which being agreed, the Order, with the said Amendment, was sent down to the House of Commons, by Sir Edw. Leech and Mr. Page, to desire their Concurrence therein. The Earl of Pembrooke informed this House, "That he hath received Two Letters, of the same Tenor; which his Lordship desired the Advice of this House therein." Shall draw up a Declaration, to set forth the State and Progress of the whole Business of the King's sending for Lords from this House to Yorke, with the ill Consequences and Dangers thereof; and to review the Orders and Resolutions of this House made in this Business. Any Three to meet at Three a Clock this Afternoon, and when they please else. The Petition of John Van Hesdonche was read; "That he having an Order of this House, to quiet his Possession in some Fens in Holme, in Northfolke, the said Order is disobeyed, his Corn spoiled, his Ditches thrown down in a riotous and tumultuous Manner, and spoke divers contemptuous Words, and tore the Orders, as appears by an Affidavit." To desire that the Committees that went into London to borrow Money Yesterday may meet this Afternoon, and draw up (fn. 2) Public Thanks, to be given them from both Houses, for their Forwardness and Chearfulness in lending the Hundred Thousand Pounds for Ireland; and also a Declaration to be published, expressing their Forwardness in this Business; and also that the Committees may appoint what Time to go to the City, to give them Thanks. The Lord Wharton reported, "That the Committees for the settling of the Militia met Yesterday, and considered how to provide for the Indemnity of those that have exercised the Militia voluntarily; and the Opinion of the Committee was, That it might involve those that have met illegally; but, if any be disturbed that have done it legally, then the Persons that do disturb them to be punished: And, in the general, the Committees thought fit, that every Country should muster, and that every Lord Lieutenant should be present himself at the First Muster; and the Neighbour Counties to London as soon as conveniently may be." Ordered, That the Petition of Rich. Rishborne, a Frenchman; Servant to the French Ambassador, is referred to Mr. Baron Henden, who is to make Report thereof To-morrow. Ordered, That the Writ of Error between Smith and Busby shall be argued on Saturday next come Sevennight, in the Afternoon, at Three a Clock; and the Judges to be present. Upon the Petition of Tho. Burwell; it is Ordered, That Mr. Smarte, or his Agents, shall shew Cause within Two Days, why the Suit in the Exchequer, mentioned in this Petition, shall not be stayed. Ordered, That such as have disobeyed the Order of this House concerning Tamer shall be sent as Delinquents. Hodie 3a vice lecta est Billa, An (fn. 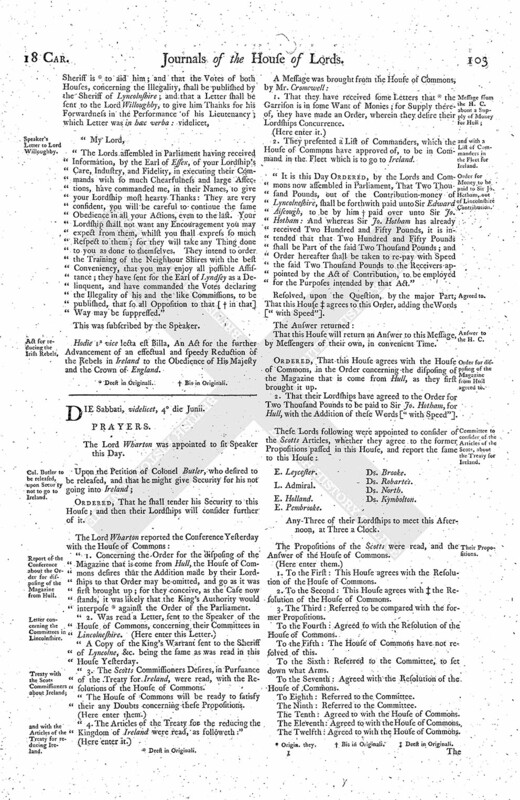 3) Act for the calling of an Assembly of Learned and Godly Divines, to be consulted with by the Parliament, for the settling of the Government and Liturgy of the Church, and for the vindicating and clearing of the Doctrine of the Church of England from false Aspersions and Interpretations. And, being put to the Question, it was Resolved, That this Bill, with the Amendments now read, shall pass as a Law. Hodie 1a vice lecta est Billa, An Act for the avoiding of Actions in some Cases. 1. To desire a Free Conference, touching the Order concerning the Magazine come from Hull. 2. To sit this Afternoon. 3. A Conference touching some Letters, which they have received from Lyncolneshire. Ordered, That this House shall sit at Three a Clock this Afternoon; and the Conferences to be presently. The Messengers were called in, and had Answer given them according to the abovesaid Order. Ordered, That (fn. 3) the Parties and their Counsel shall attend this Afternoon, concerning the Writ of Error between Lenthall and Bruton; and the Plaintiff to have Notice; and if, upon that, he appear not, then the Writ to be transmitted into the King's Bench. The House of Commons being not now ready, the Lords have appointed to have the Conference at Three a Clock. "Right Trusty and Right Well-beloved Cousin and Counsellor, We greet you well. Whereas We have some Occasions of Importance, highly concerning Our Person, Honour, and Service, wherein We think good and are very desirous to receive your Advice and Assistance, having had Experience of your Affection, Wisdom, and Integrity; Our express Pleasure therefore is, and We do hereby will and command you (all Delays and Excuses set apart), to make your immediate Repair hither to Us, when you shall understand the particular and urgent Causes of this Our sending for you; of which you may in no wise fail, as you tender the Good of Us and Our Service; and for so doing, these Our Letters shall be your sufficient Warrant. "Given at Our Court at Yorke, the Thirtieth Day of May, 1642. "To Our Right Trusty and Right Well-beloved Cousin and Counsellor, Algernon Earl of Northumberland, Our Lord High Admiral of England." "Right Trusty and Right Well-beloved Cousin and Counsellor, We greet you well. Whereas you are to give your Attendance at this present Session of Parliament, according to Our Writ of Summons directed unto you; yet, in regard that We have present Occasion to make Use of your Service in these Parts, your own Occasions also requiring your Absence from this present Parliament; We do hereby let you know, that We are well pleased to dispense with your Absence, and do, by these Presents, give you Licence to be absent from Our said Parliament (Our said Writ, or any Thing therein contained, to the contrary notwithstanding); so as nevertheless you cause your Proxy to be left with some such Person as may, for you, and in your Name, give his Voice and Consent unto all such Matters as are to be treated and concluded in Our said Parliament; and these Our Letters shall be your sufficient Warrant and Discharge in this Behalf. "Given under Our Signet, at Our Court at Yorke, the Thirtieth Day of May, in the Eighteenth Year of Our Reign. The Petition of Mary Bagshaw, Margaret Wright, and Henry Bagshaw, shewing, " (fn. 4) That Tho. Bagshaw doth refuse to perform the Order of this House." Ordered, To be referred to the Committee for Petitions; to meet on Tuesday next, in the Afternoon, to consider of the Petition, and report the same to the House. Ordered, That Mr. Steward's Cause shall be heard on Friday, the First Day of July next, before the Committees for Petitions; and that the Parties shall have convenient Notice hereof. Ordered, That Sir Thomas Carie's Cause against the Bishop of Ardagh shall be heard on Monday Morning next. "Trusty and Well-beloved, We greet you well. Whereas We understand, that the Store of Ammunition for that Our County is now remaining in the Hands and Charges of yourself and other the Deputy Lieutenants of that Our County; Our Will and Command therefore is, That you take present and effectual Order, that no Part of the said Store of Ammunition belonging to that Our County be, by any Warrant, Order, or Ordinance of Parliament, or otherwise, disposed of into any other Hands; but that you, and the rest of the Deputy Lieutenants of that Our County, take special and effectual Care to keep the same in safe Custody, in such Hands as you will be answerable for, until further (fn. 5) Order from Us, or the Earl of Lyndsey, Lord Lieutenant of that Our County; to the End that the Peace and Quiet of Our Subjects there may not in any Sort be disturbed: And herein you and they may not fail, upon your Allegiance to Us, and you will answer the contrary at your Peril; for which this shall be a sufficient Warrant. "Given at Our Court at Yorke, the 28th of May, 1642." To desire that One of the Particulars at the next Conference may be about the Treaty of the Scotts Commissioners, touching Ireland. 2. To join in an Order with the House of Commons, concerning Money, which they understand is to be paid in London, which was made over by Exchange; which they conceive is the Money (fn. 6) for which the Jewels of the Crown were sold. That this House will give a Conference, touching this Particular, concerning the Treaty with the Scotts Commissioners, concerning Ireland. As for the Order, this House will take the same into Consideration. 1. Brought up a Bill, intituled, "An Act for the further Advancement of an effectual and speedy Reduction of the Rebels in Ireland to the Obedience of His Majesty and the Crown of England." This is a Probability to raise great Sums of Monies, touching the Business of Ireland; (fn. 7) therefore they desire Expedition may be given herein. 2. To desire their Lordships Concurrence in an Ordinance, concerning the setting (fn. 8) forth of Twelve Ships, for the Adventure for Ireland, desiring Expedition; for the Adventurers are at a great Charge, of Two Hundred Pounds a Day; and divers of the Ships are fell down to Gravesend. This Ordinance was read presently. Ordered, To be considered of To-morrow, by the whole House. Ordered, That the Lord St. John's Business, against Mr. Benion, shall be put off until Monday next. The Earl of Essex informed this House of the Contents of the Lord Willougbie's Letter, "That †† he will put the Militia into Execution on Monday next; that the Earl of Lyndsey hath a Commission from the King, and he endeavours to hinder the Militia; he desires that the Neighbour Counties to him may be mustered." 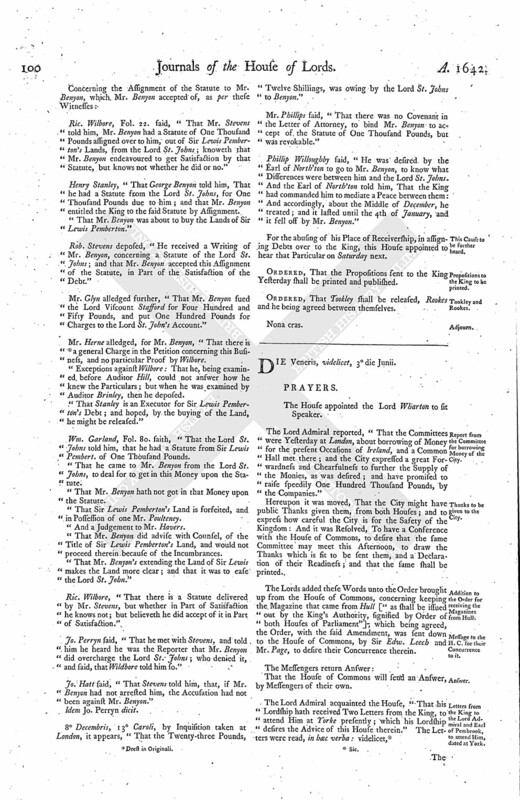 "The Lords assembled in Parliament having received Information, by the Earl of Essex, of your Lordship's Care, Industry, and Fidelity, in executing their Commands with so much Chearfulness and large Affections, have commanded me, in their Names, to give your Lordship most hearty Thanks: They are very confident, you will be careful to continue the same Obedience in all your Actions, even to the last. Your Lordship shall not want any Encouragement you may expect from them, whilst you shall express so much Respect to them; for they will take any Thing done to you as done to themselves. 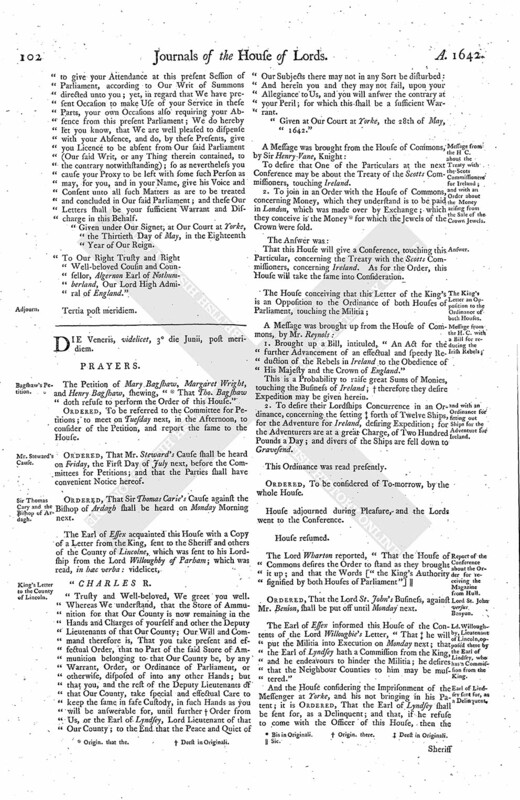 They intend to order the Training of the Neighbour Shires with the best Conveniency, that you may enjoy all possible Assistance; they have sent for the Earl of Lyndsey as a Delinquent, and have commanded the Votes declaring the Illegality of his and the like Commissions, to be published, that so all Opposition to that [ (fn. 11) in that] Way may be suppressed." This was subscribed by the Speaker. Hodie 1a vice lecta est Billa, An Act for the further Advancement of an effectual and speedy Reduction of the Rebels in Ireland to the Obedience of His Majesty and the Crown of England.